King House was built in 1730 as the seat of the King Family, a powerful landowning dynasty. The house later became a military barracks and recruiting depot for the famous Irish regiment of the British army, the Connaught Rangers. At the end of the Civil war in 1923, the barracks passed into the control of the Irish Free State Army. Following many years as a merchant’s store, King House was saved from demolition in the 1980's and restored to its former Georgian style by Roscommon County Council. The house is now open as a museum housing many exhibits. 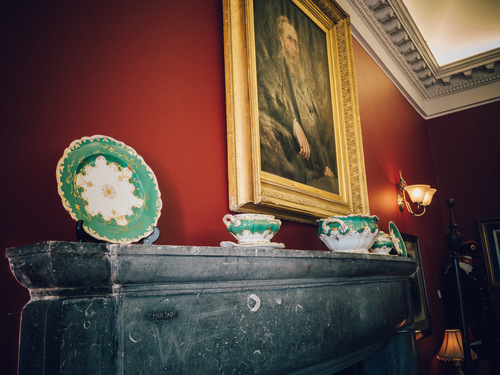 It is home to the Connaught Rangers museum, the McAleese Collection, Boyle Civic Art Collection, a tribute to Maureen O'Sullivan, a look at Gaelic Ireland and it also houses an exhibit to its time as home to the King Family. The house is a very popular location for civil wedding ceremonies, rooms are also available to book for any special occasion, meeting or conference. Click here to learn more. King House is fully accessible to wheelchair users, with an elevator between floors. A tour of the house takes approximately 60 minutes. Audio Packs are available for self-guided tours. During peak season, we also host guided tours throughout the week, times for which are advertised at the Reception Desk in King House. Visitor Guides are available in French, German, Italian and Spanish.